With a couple of frosts during the week, winter continues it’s inevitable march towards us although on waking this morning it was actually pretty mild. On a personal level, my back has been playing me up again and to top things off, I’ve got a stinking cold, which is nice! 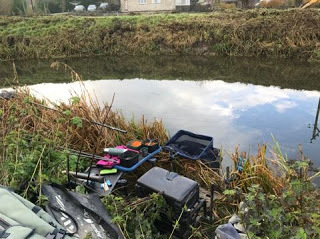 Hurf was back to take over the reigns and decided to put a few pegs in at Hambridge as most of it has been dredged now, so it would be interesting to see how that fished today. After another lovely bowling club breakfast it was time to draw, per usual I’ve gone in the bucket with only a couple of ping pong balls left and pulled out H5 at Hambridge, it can be a brilliant peg, although I struggled the last time I was on it. For company I had Adie below me by the bridge and Fieldy was on H6 above me. I got to the river and put my gear over the fence (with the help of Adie – cheers mate) before taking the car up to the car park. 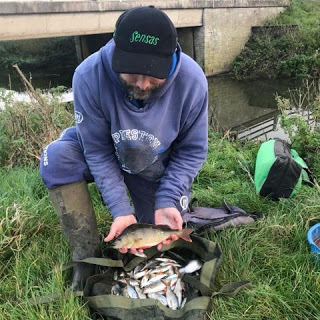 As I walked across the field and got to my peg, it looked lovely with loads of tiny fish (and the odd better one) topping, I said to Adie it was solid and really thought I was going to bag up. 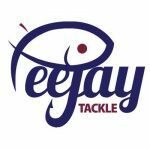 I set up a 1 gram bodied float to fish down the middle in the deepest part of the peg along with a 0.2 gram Drennan AS1 to fish three sections to hand. I flicked the lighter rig out to check it and a tiny roach took the bare hook so there were obviously a few fish there! On the side tray I had maggots, casters and Bait-Tech Super Seed hemp. I had time for a quick coffee so went down to have a quick chat with Adie, his swim looked nice although it was still pretty weedy, Graham joined us briefly before we all wandered back as the start time approached. I shouted the all in and flicked out the lighter rig with a single red maggot on and was sure it would go under straight away, but it didn’t, in fact, after ten minutes, I still hadn’t had a fish!, although to be fair I had missed a couple of indications. I shouted down to ask if Adie had caught and he said he was getting a few small fish, finally my float sunk from view and I swung in a small roach, two more followed before the next bite resulted in more solid resistance and a decent roach of 4-6oz came to the top, like an idiot, I went to swing it and it dropped off, never mind I thought, plenty more where that one came from. 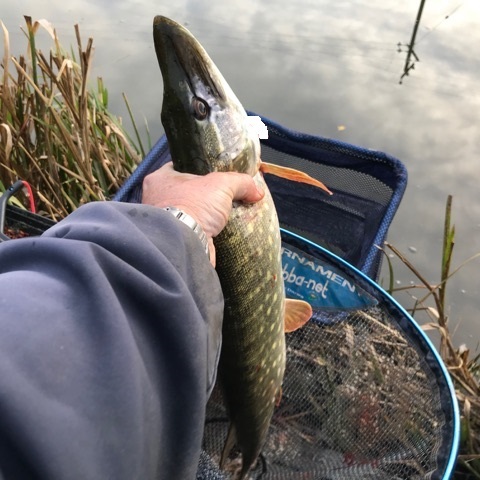 Another small roach next chuck and then the bites just stopped and this wasn’t in the script! After a another fruitless five minutes, I had to try something else so picked up the heavier rig and held it back in the flow but never had a touch, despite trying several different areas. Back on the three sections to hand rig and the float dipped before sliding away and on the strike, a much better fish was hooked, from the way it was fighting I knew it was a perch and I slid the net under a beautifully coloured fish of a pound plus, this was more like it! A couple more tiny roach followed as the first hour came to a close but then I couldn’t buy a bite again, I was just thinking what my next move should be when the float disappeared and another decent fish was on, it felt like another good perch but I’ll never know as the hook pulled out and when I swung the rig in, there was a weed on the hook – gutted. 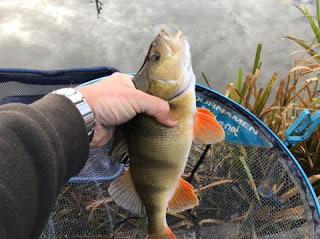 No more bites so I had another quick go with the heavier rig but it was a waste of time, back on the lighter rig and another positive bite saw a decent perch shaking it’s head, I was praying it would stay on and breathed a sigh of relief as I slid the net under another pound fish. So after ninety minutes I probably had 2.5lb and although I wasn’t bagging, I know the swim holds more perch and it does throw up chub on occasion, so a good weight was still possible. 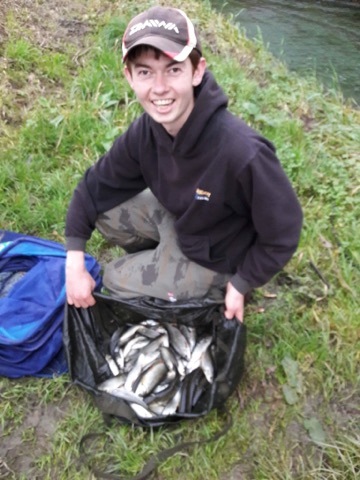 I shouted up for a quick update from Adie who replied he was catching small fish and had also landed a decent perch, I heard some shouting from above me and it sounded like Fieldy was having a few problems with the cows which had so far left me alone. Once again my bites dried up and I tried the heavier rig again but still couldn’t get a bite on it, I started feeding quite heavily down the peg and tried holding the rig back at the bottom of the bend (where I’d caught a few fish the last time I was here) but not a sniff and I was out of ideas. Over the next couple of hours I swapped between the two rigs and tried different areas but the only fish I added to the net was a tiny minnow. Going into the last sixty minutes, I went back to the bottom of the swim with the heavier rig and as I picked up the catty to feed, the float went under and although it took me by surprise I managed to hit the bite which was from a small roach. I had four in as many chucks and was just thinking I could end the match with a flourish when the bites stopped as quickly as they’d started. After another biteless five minutes, I was going to try the lighter rig and as I shipped the pole back, I looked behind me and as I did so I heard a splash, looking back my pole elastic was all over the place and I guessed a pike had grabbed the rig, I shipped back gently in case it was a chub that had been hanging on to the bait but after five minutes, I could see it was a jack pike and eventually landed a fish around 5lb hooked squarely in the scissors. Possibly the reason the roach wouldn’t settle! After all that commotion, I was sure that would be the last of the action for me but next put in, the float barely settled before going under and another roach was on. I don’t know whether it was the time of day or the fact I’d upset that pike but I couldn’t get the rig in fast enough. 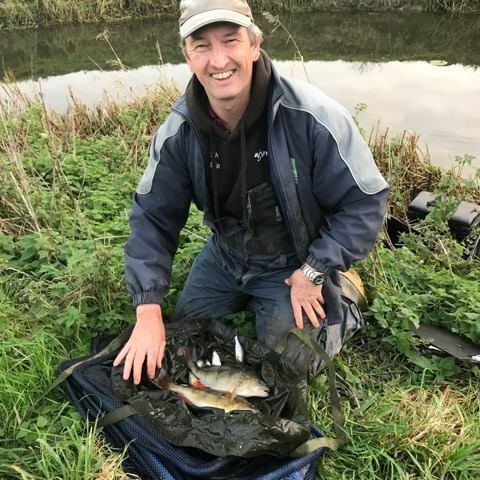 I did bump what felt like a better fish and as it neared the end of the match, the roach were getting bigger and I netted a couple of 3-4oz fish. In the last half an hour, I think I had 15 roach for probably a pound or so, why couldn’t they have switched on earlier? I shouted the all out and after I packed up, I walked up to weigh Adie in, he had loads of fish for 14lb 2oz and I said he’d be there or thereabouts with that today. As we walked to my peg, we realised we couldn’t see Graham and I think he’d had a nightmare with the cows and gone for an early bath. My 25 fish weighed 3lb 13oz so no pick up today but hopefully I’d still get half decent section points for the league. 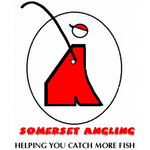 We’ve had six different winners so far with Frank Woodard the only angler to win more than one match.